A great investment opportunity to pick up 56 lots pre development stage in one parcel for less than half of what they are worth! , this farm has many flat building areas spread through out it`s rolling hills, nestled in a beautiful jungle setting and all with great mountain and ocean view and has just over 1 km of river frontage with numerous large flat areas and 2.5 miles of internal dirt road through the farm ... 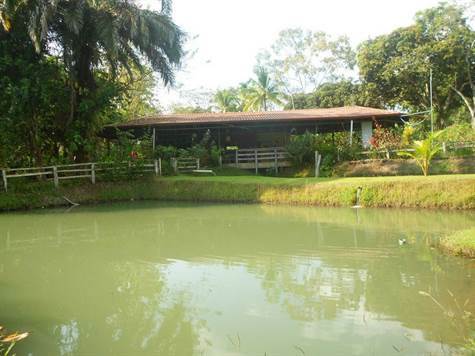 The property already has a bar and restaurant, 8 tilapia ponds, swimming pool, a small soccer field and large green areas with beautiful gardens... It is located in San Antonio, Damas, aprox 10 minutes off of the main highway, and about 30 min from Manuel Antonio beach.... This is a must see for any developer looking for the possibility of doing commercial and residential development..